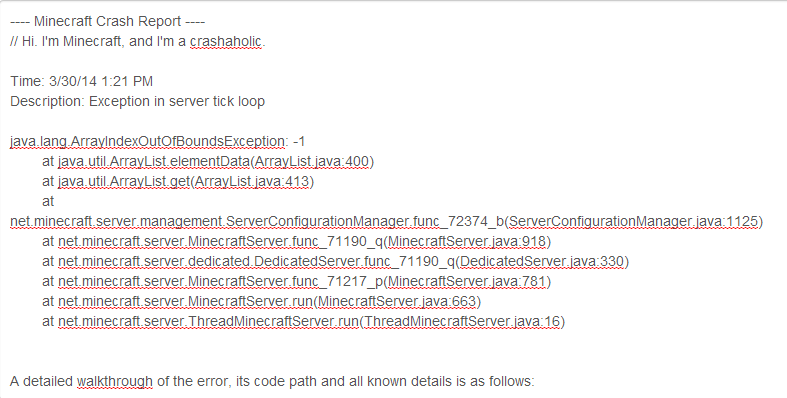 Its common for modpacks to crash, so you will need to know the ins and outs of why this happens, how to prevent it and how to fix it. The most common reason for crash reports are world/chunk corruption, unfortunately 99% of the time, you will need to create a new world, this is why we suggest backing up your server every night. Reinstall your modpack of choice, restart the server and check if you can connect. Check the crash report doesn't contain the Out of Memory error, if this is the case you will need to upgrade your server. Try making a new world, restarting and if you can join, unfortunately your world is corrupt. A crash report in NiTROPanel will look like the following..